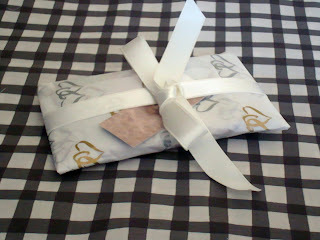 I couldn't believe that Frances from Home Made Originals sent my prize to me so fast. Totally amazing. I realize she lives in an adjoining state to me but that was really zippy. It was packaged so cute. Of course I saved the ribbon and her card. Now I can keep my business cards organized in my purse and easily available. Its darling. And its red. Thank you again Frances. So my goal was/is to stay caught up with Dear Jane. I came home last night and went into action. This block was hard but seriously - hard is an understatement. It took all evening. Look at Anina's block and then at mine. Really? how does she do that? 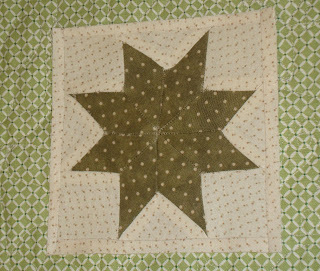 I had jagged edges so I had to make a tiny border in self fabric in order to save it. If it weren't so hard, I'd do it again. But look at it. It has 6 set in blocks. Seriously it was a 10 (to me at least) on a scale of 1-10 difficulty. I'm just glad that one is behind me. Whew. This fabric is inspiration for a new project. I have to finish what is on my plate now but I'm sketching and pondering. The creative aspect is very fun. I can proudly say I'm up do date with my Dear Jane blocks. YAYYYYY! But it is short lived. Anina will have a new one up today. I'm feeling more relaxed about it. 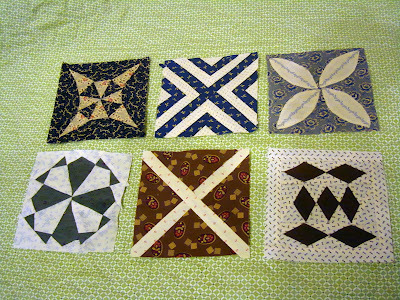 My blocks are certainly flawed but I'm either becoming more tolerable of the mistakes or they may be minimizing. Either way I'm glad I have been enjoying them more. I guess I've finally stopped fighting and I'm now drinking the paper piecing Koolaid. See, not perfection but not embarrassing either. But if it were a close-up you'd see the real deal. I find myself doing well with the blocks, in general, until the last steps putting the pieces together and thats where my mistakes occur. I'll have to work on that. Opps my shadow is in this picture. 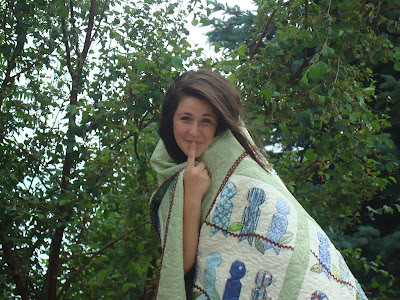 Here is daughter #7 being cheeky with my "Treetops" quilt. 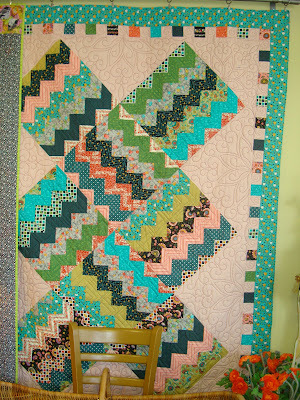 I made several attempts this weekend to photograph the quilt for the pattern cover but I was never satisfied. Laurie and Jamie were supposed to be helping me with the photography but you can see they did more goofing around than snapping pictures. I'll keep trying. I think I have a new idea. 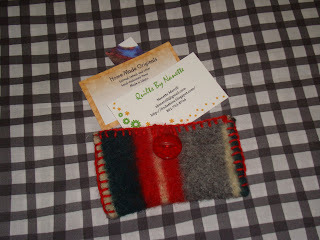 I won a business card holder from Frances at Home Made Originals this weekend. Its darling and in my colors! Thanks Frances. I'm very excited. And we got 2 blog awards this weekend. A big thank-you to Blondie and Erica. Both of them are talented girls and very sweet people. 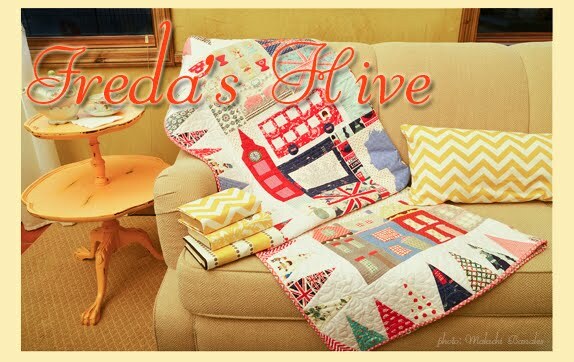 It is so nice to have our blog recognized and featured. They both said such nice things. I thought I would pass the award to 3 brand new blogs. I want to encourage these sweet gals and their blogging. 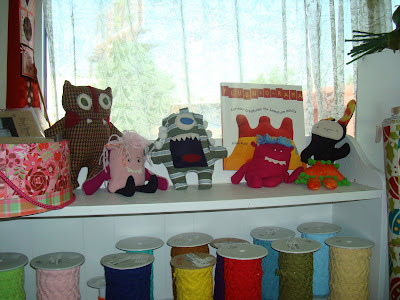 CJ at A Stitch and a Prayer, Jill at Life with a View, and Nedra at Cactus Needle - They are all very brave for entering the world of blogging and sharing their creativity with us. I look forward to great things from these 3 new bloggers. And I award them the Arte y Pico Award for Blog Excellence. Now they can pass it along. 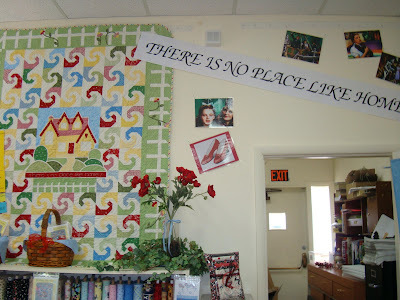 Our next stop was Quilts Etc. in Sandy. Their fairy tale was Cinderella. They always take the shop hop theme and have fun with it. 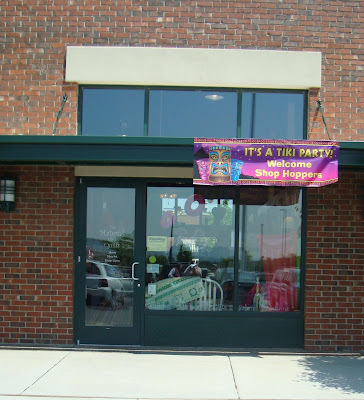 The sign out front says "Welcome to Cinderella's Ball". 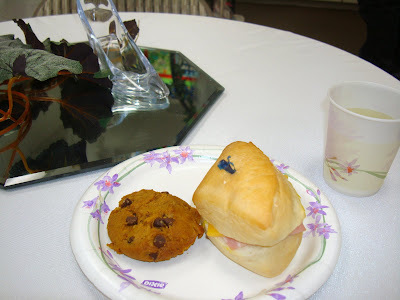 Their classroom was decorated and had snacks for the weary shop hoppers. 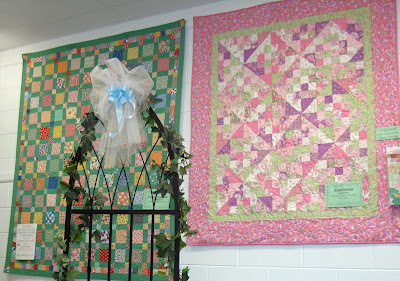 The walls of the classroom were lined with great quilts to look at as shop hoppers took a break. They had a gold ring toss, which I did not win. 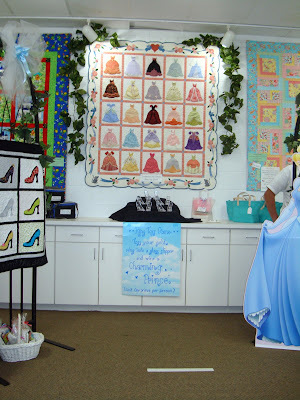 And front and center in the classroom was their Cinderella's ball gown quilt. And they gave a free pattern for it. It was a darling quilt. 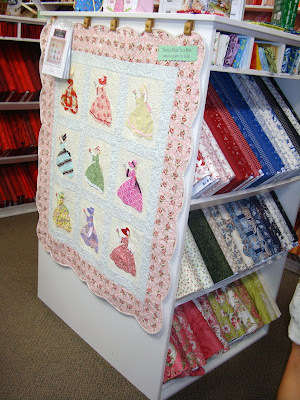 There was another gown quilt displayed in the main quilt room, sort of a sunbonnet Sue variation. 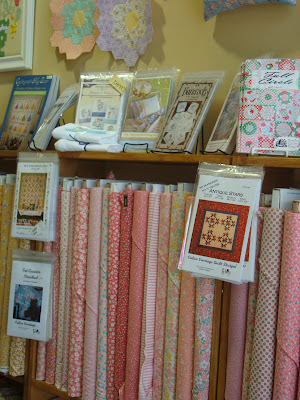 We went to Thimbles and Thread in Draper next. 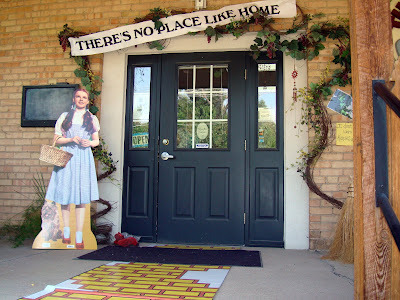 They were celebrating Wizard of Oz. 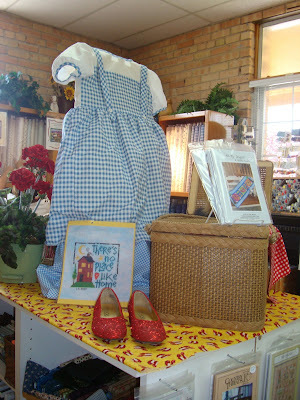 Dorothy and Oz decorated the entire store. 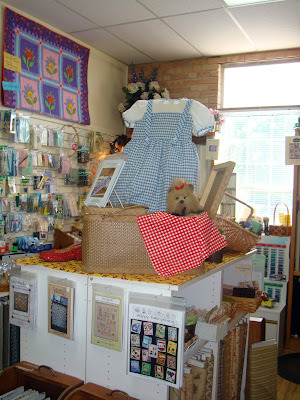 The clerks all had aprons in blue gingham, too. 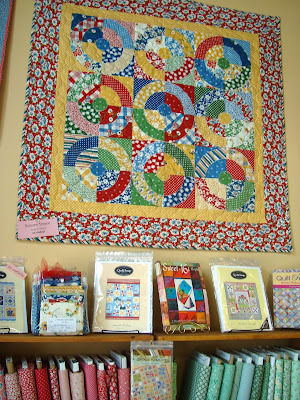 This is their shop hop quilt but no free pattern. 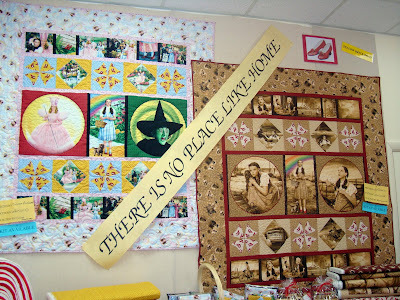 They also had 2 other Dorothy themed quilts in their classroom. The Toto in the basket was my favorite decoration. It is a cute shop but it was pretty crowded by the time we got there. We skipped over to a "by way" store not on the shop hop list. But actually this was my favorite shop of the day (2nd favorite was Pipers). 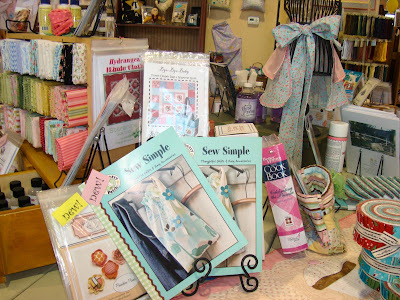 The Material Girls store was featured in a Quilt Sampler this year as a favorite quilt shop. It deserved the attention. I could nearly live there! And I took a ton of pictures. The following are not even all of them. This simple quilt was by the back door. 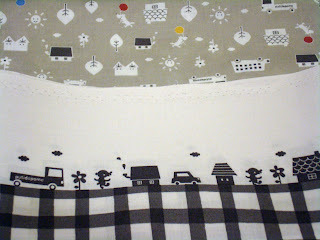 Such a plain pattern but it comes alive with these reproduction fabrics. 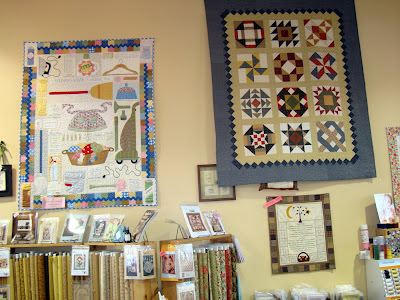 They have great fabrics and displays and so many unique independent quilt artist patterns. I was really impressed with all of it. There is so much in this store but it doesn't seem cramped. 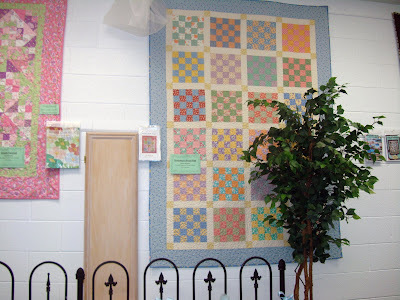 They have it set up really well and the ceilings are so high that the quilts have space enough so you can really enjoy them. 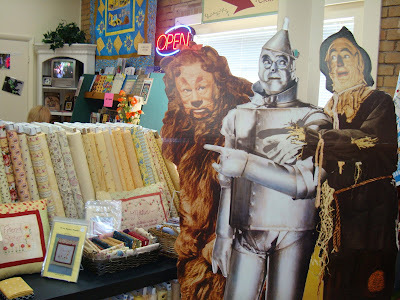 They had some unique items and I did get some fabric and patterns at Material Girls. The store is pretty big and they had plenty of help to move shop hoppers along. I'm done shop hopping. 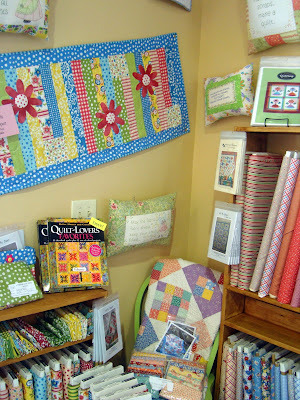 I know lots of quilters get to every store but I just go to a few each year. It makes a fun but exhausting day. 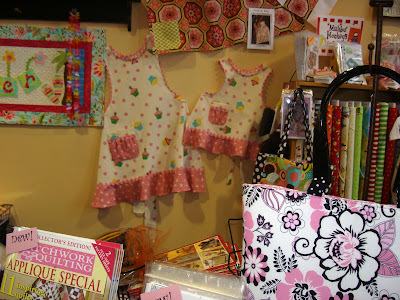 Shelbie and I went to 4 official Shop Hop stores and 1 byway shop. It was a fun day but when we got home Shelbie and I were so worn out we had to take a power nap. It wasn't just being tired it was feeling overstimulated. 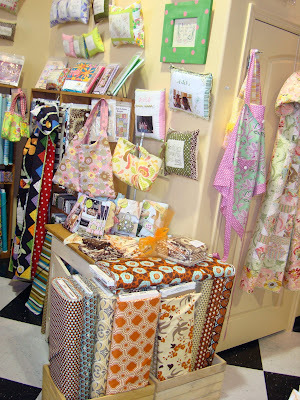 So many fabrics, colors, patterns, people, and things things things. 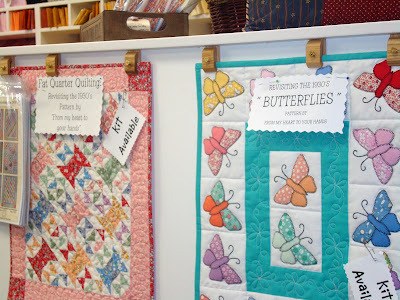 I can only imagine how overwhelming Quilt Market must be! Here is my haul. Its not excessive or impressive. I tried to stay on budget and did okay. I mostly went for sale things. I got a few magazines that are generally not available around here. 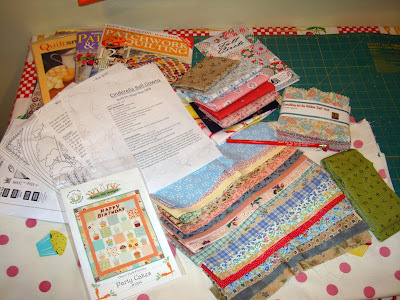 I got a Bunny Hill pattern, a Busy Bee Quilt pattern, free fairy tale patterns from the shops, fat quarters, charm squares, binding, and misc. 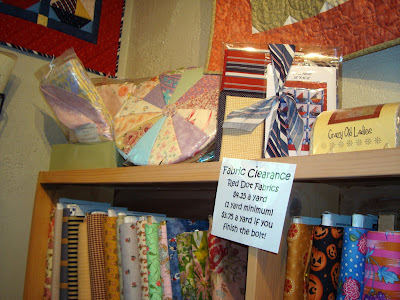 sale assorted odds and ends of jelly roll strip pieces. I also got some thicker fabric with cupcakes to make aprons. 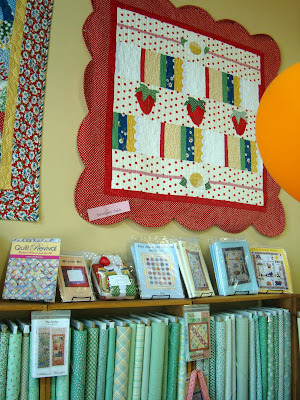 First we went to Piper's Quilts in Sugarhouse South of Sale Lake City. 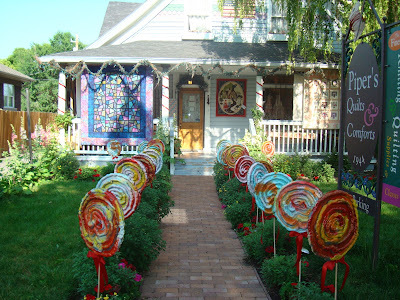 They had lollipops to greet you as you walked in . 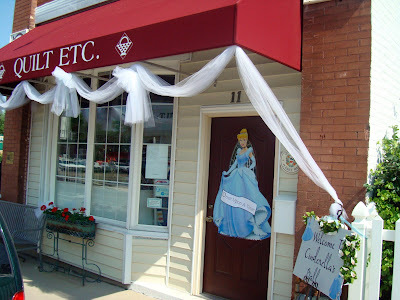 I thought they had decorated the cutest of all the stores we went to. And it totally helps that they have hollyhocks everywhere. That added to the whimsy of the fairy tale theme. 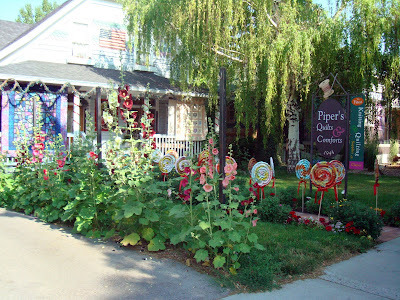 Pipers is famous for its hollyhocks. 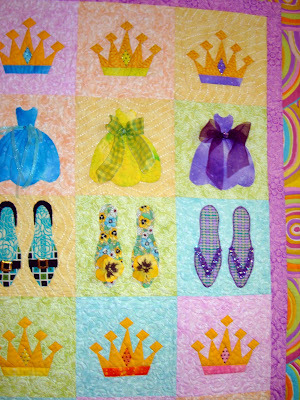 Their fairy tale quilt greeted us on the front porch. 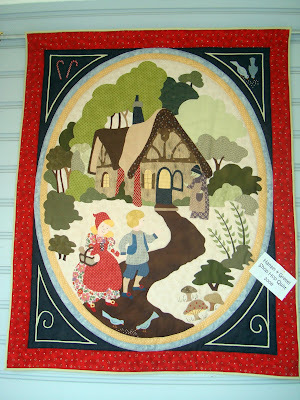 The Hansel and Gretel theme was taken all through the shop. We brought home a free pattern to make this quilt. 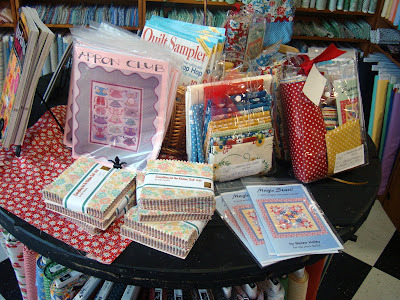 They had fat quarters folded like lollipops and wrapped in cellophane all around the store. 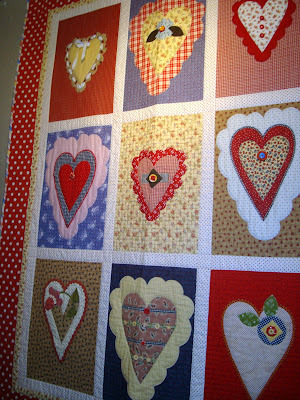 This quilt with hearts looked like sweet heart cookies or gingerbread cookies good enough to eat! 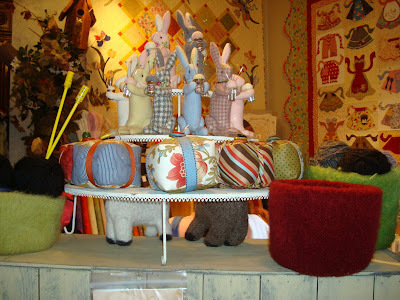 Pipers had a whole display of pincushions with darling bunny pincushions from Bunny Hill. 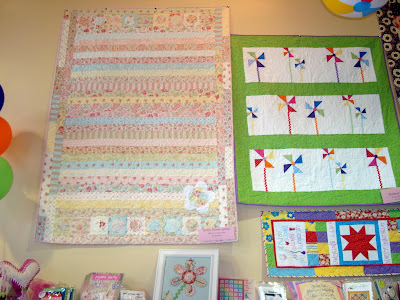 In fact Pipers had lots of Bunny Hill and Late Bloomer Quilt patterns. We got a few things here and enjoyed seeing Erin and the shop. 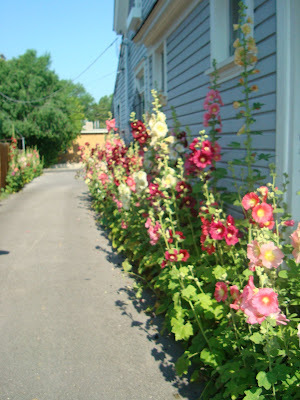 On the way out we walked by the beautiful Hollyhocks again. Seeing them year after year at Pipers made me plant them in my yard last year too. Mine aren't in bloom yet. But soon. 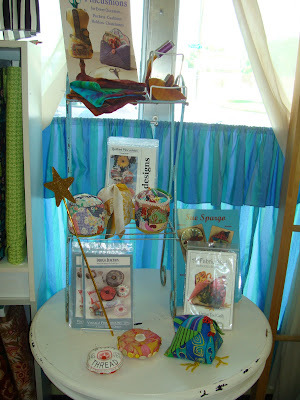 Next we went to the new location of Whimsy Cottage. 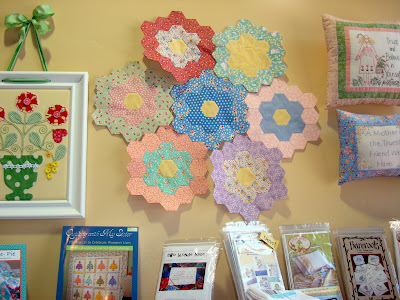 Whimsy used to be in Heber City and we'd drive up maybe twice yearly for sales and enjoy that small community. Now they have relocated in the Holladay area of Salt Lake County. Holladay is not an area I know very well. At one point we took a wrong turn and Shelbie and I felt like we were in a corn maze, without the corn. Luckily we ended up where we started and then went back on the main road. 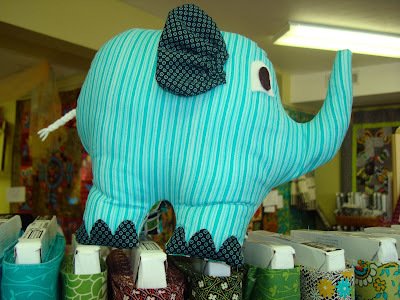 We liked this cute little elephant that greeted us when we went in. 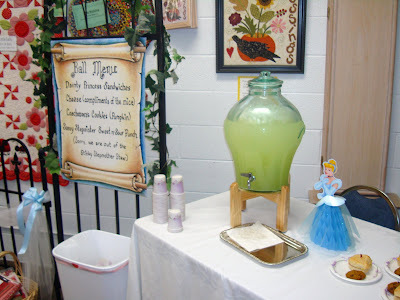 Whimsy's theme for the Shop Hop is 12 Dancing Princesses. Its a book I used to read to my girls when they were little. 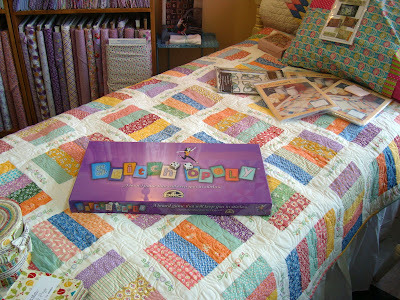 This is their Shop Hop Quilt and they gave the pattern out for free. 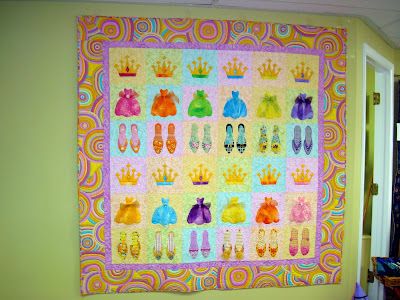 It was cute with crowns, gowns, and dancing shoes on it. 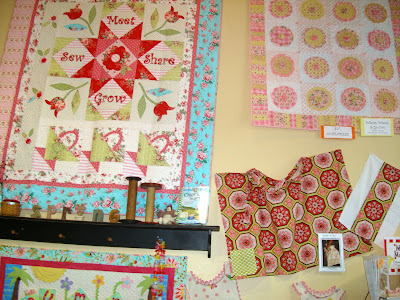 This quilt caught my eye when we first walked in. It was kind of off center but the zig zag designs were interesting. I still haven't quite figured out what is going on with it but it is interesting. Before we left the store, this shelf with a cute owl caught our eye. They had made several interesting stuffed toys that we had to examine. But the owl in the felted wool was the cutest. 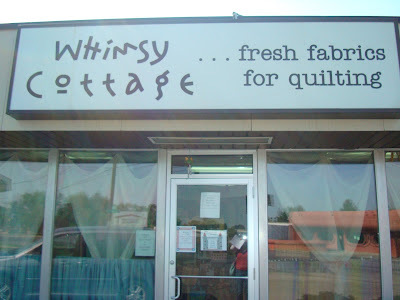 We left Whimsy (and thats when we got semi-lost) and headed south to Quilts Etc. in Sandy. They had a cute theme. More on that another day, maybe tomorrow. Now to bed.